Coalition of Niger Delta Agitators (CNDA), the umbrella body of militant groups in the Niger Delta, has vowed to resist any attempt to foist President Muhammadu Buhari on Nigerians. It also declared that the people of the region will not support Buhari’s re-election bid. 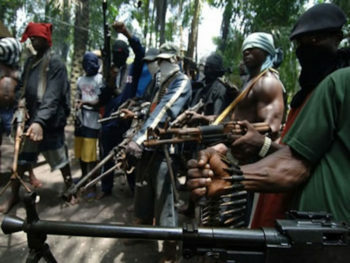 The militant groups warned that the 2019 general election would be bloody should anybody or security agents attempt to rig the polls in the Niger Delta region. The coalition, CNDA , comprises Niger Delta Avengers, Niger Delta Volunteers, Bakassi Strike Force and Niger Delta Warriors. Others are Niger Delta Peoples Fighters, Bakassi Freedom Fighters, Niger Delta Movement for Justice and Niger Delta Fighters Network. The Convener of the coalition group, John Duku, in a statement yesterday, said the militant groups in the region have perfected plans to deploy their men in polling units across the South-South geopolitical zones. “We have sensitised our members and affiliates on how and who to vote, come February 16, 2019. I also want to assure you that our men would be on the ground in all the polling units across the Niger Delta region. “If we notice any attempt to rig election by anyone, including the security agents, it shall be bloody. Let people vote (according to) their conscience and let the vote of the people count. “We want to assure you that President Buhari will not return in 2019 except INEC compromises election results. Buhari has neglected the Niger Delta people to the extent that we would have reacted in a very negative way if not for our elders and leaders who continuously calmed us down. You can now order Dangote cement in units or truck loads online and get it delivered to your preferred door-step or construction site which is far better than driving from one depot or dealers shop to another.Distributing directly from The main Factory to all parts of the country to Sub- distributors, Wholesalers, Retailers and End- users at a promo price of N1,3OO per Bag of Cement and N1O,OOO per 5OKG bag of RICE. Delivery is guaranteed within 48HRS after booking. Contact The Marketing Manager (Jubril Abubakar) on O7O166O706O FOR BOOKINGS AND ENQUIRIES.